This entry was posted in All Occasion, MISTI Tool, Unity Stamp Co.. Bookmark the permalink. Your cards turned out beautiful. Love the shading you achieved!! Love the purple vibrant dots on the mushroom…. Just makes the pink shell of the snail stand out! hey jeanne. it’s been a long time. hope you are well. absolutely LOVE the cards! UNITY is one of my fav companies too. fabulous products. have a great weekend. very stunning…esp like Grey Skies Happy! I love this so beautiful. I love the name Inky paws too. Very nice. Never thought I could love a mushroom so much. Nice work! such sweet cards.. just love what you have done. Love your cards. The ‘sorry I’m late’ stamp could have been made just for me. Sweet cards! Both sets are so adorable. Adorable. Love the duck too! Love the Happy Snail Mail stamp set….just got mine and can’t wait to use it! I love both of your cards! I don’t have the snail, but do have the duck… a misti would be handy for lung things up to do a reflection card too. Thanks for sharing! Oh your colors are so vibrant and lovely. Thank you. I love this snail stamp!! Your coloring is PERFECT. I am loving this snail. So glad I ordered him last round. You do beautiful cards, love your shading. Love both images (but the one of the duck is one of my favorites). Great tip about stamping again after coloring to make it stand out. The cards keep getting better! I love both your cards. Both sets are amazing and you did them proud. Love the SnailMail set. The duck is cute…might have to get it too. You’re cards are so beautiful!! Both of those stamp sets are on my wish list. Great cards and very good advice about restamping in black ink for a nice crisp image. Thanks! Beautiful cards Jeanne! I’ve never thought to restamp my images in black after coloring. I love the crisp look that gives. Definitely going to do this. Thank you for the tip! beautiful cards! love your coloring! LOVE that stamp and your coloring! Jeanne, I love these great cards, and I have become quite a fan of Unity stamps. 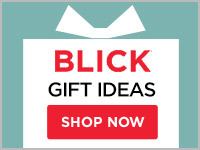 Their images are wonderful and their sales excite me. A great combo for this consumer!! Love, love, love how you colored these adorable Unity stamps. Love both my Misti and Unity stamps. Super fun blog hop seeing all the different ways the same images can be used. 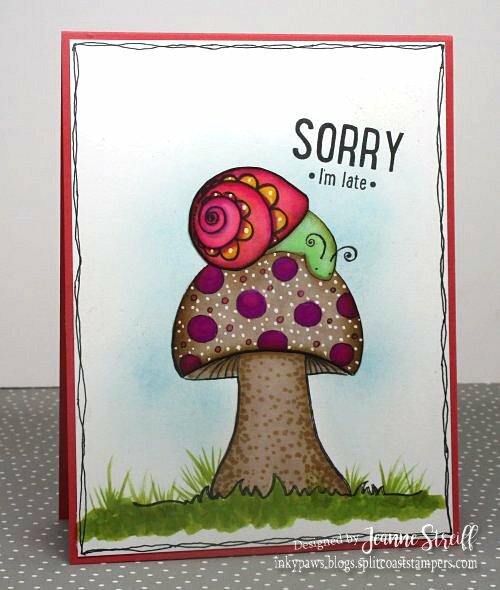 The mushroom stamp is one of my favorites! Love what you did with it!! beautiful, vibrant colors! love your cards! 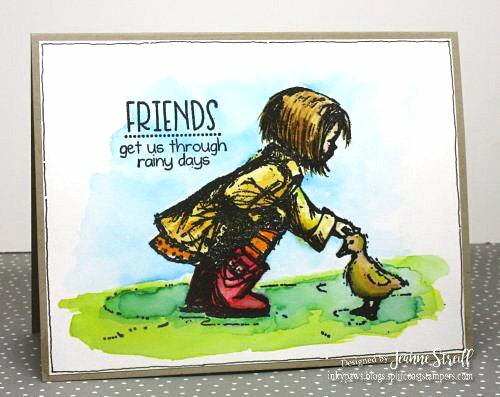 I adore the card made with the little girl in the rain gear and the duck – it’s absolutely adorable! Love the doodled border on the first card! Sweet cards – if the snails in my garden were pretty like that maybe I would use less salt and more beer. Beautiful cards. Love your addition of the doodled borders. Love the colors on the snail card. So pretty! omgosh! these are SO CUTE! Love your cards! Your coloring is fabulous! I have the Snail Mail kit. I need to get the Phyllis Harris one! Such sweet cards! Love your coloring style! So so cute!!! Love that snail! 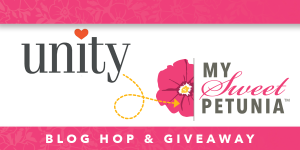 Great idea this blog hop! So many great ideas! 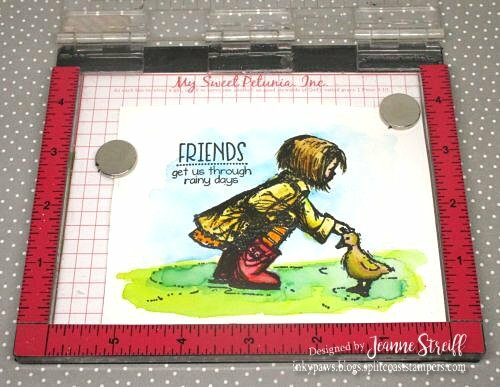 Fabulous cards as always Jeanne – I have to admit, I love the ducky! Love the snail! Your cards are terrific! Jeanne, what great cards. Absolutely adorable images and I have to say Unity does have great stamps! How did we manage before the MISTI though? I love your stunning cards! I love seeing all of the different techniques and color combinations on the big mushroom. Thank you for sharing your cards are beautiful!!! The colors are very very nice and so is the Coloring! Thank you for sharing! Your colouring is FAB! Beautiful cards! I love the snail card. Beautiful coloring. Lovely cards, the colors are wonderful. I love the texture on that mushroom! The reflection card is suitable. Cute card! Thank you for sharing. I love the little girl in her rain coat and boots! Reminds me of that feeling of peace after a storm! Can’t wait to finally get a MISTI! Wow! Gorgeous cards and colors!!! 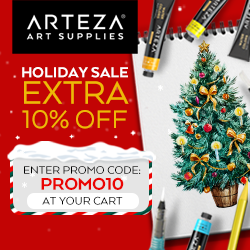 Amazing images and even more so with your coloring. Your cards are beautiful. I love the duck stamp too. Very cute cards. I like your coloring. So adorable! Great idea about using the Misti to restamp black over the colored image to add sharpness. The snail on his mushroom is so cute. The little girl with the ducky is darling. thanks for sharing such sweet cards. Sweet cards and stamps, and your coloring is so pretty! I love your cards, so beautiful. Love the idea of stamp over the image again once coloured, brilliant idea. These images are just darling! Very cute cards. Way back when I was in high school, I bought my then boyfriend (now hubby) a pair of ducklings for Easter. Why I thought that would be a good idea escapes me. Boy, did they ever make a mess when they grew up! They eventually went to live at a golf course. Lesson learned. Haha! Beautiful cards. Love the snail and the duck. Lovely cards. Your coloring is excellent. Love the vibrant colors & shading on the mushroom card. I never seem to remember to go back and restamp after I color an image. Thanks for the reminder. Your cards are adorable with these stamps. Hi Jeanne. You made this stamp come to life. Lovely work. Jeanne, I love your rendition of snail mail and that adorable little snail, but Grey Skies Happy really spoke to me. Thanks so much. A beautiful job! Wow what beautiful cards. Love your work. Thanks for sharing with us. Love your cards. please tell Echo I could not find anywhere to comment on her blog. What pretty cards – I especially like the strong colors you used. I love this stamp. So cute! So Cute. I esp like the snail mushroom. Really like how you colored it – so fun! Too cute… might Havre to add to my collection. The little girl with the duck looks like a Hummel figurine. Such beautiful cards! Love your coloring! They are really cute. I love your cards and the way you colored them! Your cards are beautiful! So bright and cheery! Nice coloring! I have both those sets! Can’t wait to play! The snail stamp is very cute! This is so cute! I LOVE the great colors and the amazing design! The little girl in the rainboots is adorable! I love how each person the colors the snail makes them their own. Pretty work as always Jeanne. 🙂 Thanks for sharing. Loved your cards! Thank you for sharing! What cute cards, loving these Unity stamps! Very pretty coloring. Thanks for sharing! Liberty ve the little duck! Great coloring. Beautiful cards! Two of my favorite sets. Both cards are so sweet. Love the colouring.